Putu Piring is a popular sweet snack in Malaysia, and typically sold at night market. 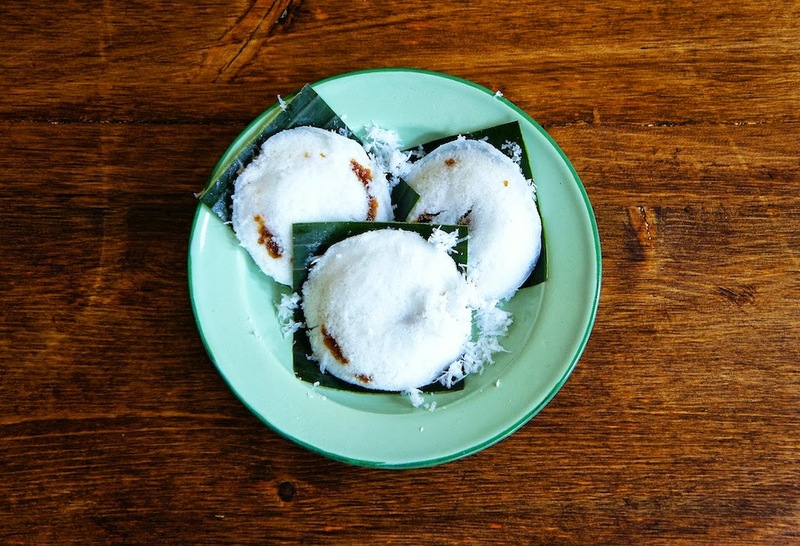 To make this delicious snack you will need rice flour, palm sugar, and grated coconut. So, check out the recipe and have fun making them. In a mixing bowl, combine thawed rice flour, sea salt, and water. Rub the flour with your fingers until they resemble fine breadcrumbs. Then sieve the lightly wet rice flour, push it through with a spatula. Set the steamer on high, once the water boiled, reduce the heat to medium. Fill about 1 to 1 ½ tablespoons of rice flour into a small saucer or mold, top with 1 ½ teaspoons of grated palm sugar, and cover with another 1 to 1 ½ tablespoons of rice flour. Lightly press the flour into the saucer and place a piece of muslin cloth over it. Turn over, and tap the saucer to release the shape rice flour onto the cloth. Steam for about 2 minutes, remove from the steamer, open the muslin cloth, top the kuih with some grated coconut, place a piece of banana leaf, place onto a plate and carefully remove the cloth. Love this! I never knew how they were made till I saw your recipe. I suppose I could just use regular rice flour, or is there a special type? You can't substitute with regular rice flour. Frozen rice flour or powder is made from rice that has been soaked in water. However, you can grind your own rice flour at home. Soak some short-grain rice overnight, drain well and grind finely. Very interesting! Would be fun to make.